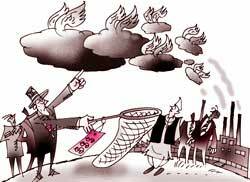 Polluters forge new climate change pact; India taken in? led by the us and Australia, six nations, including India, announced on July 28, 2005, a new pact on climate change, based on voluntary goals and measures. The "Asia-Pacific Partnership on Clean Development (appcd)" focuses on the development of clean technologies, rather than the emissions reduction target approach of the Kyoto Protocol (kp) , the global treaty to fight climate change. The us and Australia have consistently opposed kp on economic grounds. The appcd club, with Japan, China and South Korea as its other members, accounts for almost 50 per cent of global greenhouse gas (ghg) emissions. Experts warn appcd would complicate negotiations on kp's successor (required after 2012), to be held during the United Nations Framework Convention on Climate Change meet in Canada in November 2005; appcd's first meet is to be held in Adelaide, Australia around the same time. A challenge for Kyoto? "The coinciding meetings could send mixed signals...It is possible the us administration is organising...nations to try to block a new set of emissions reduction targets. The new pact provides a lucrative alternative to Kyoto or its successor," cautions Philip Clapp, president, National Environmental Trust, a us -based non-profit organisation. Surprisingly, appcd's 'vision statement on a new partnership on clean development and climate' was announced at a trade and security meet of the Association of South East Asian Nations, at Laos, Vietnam. us deputy secretary of state Robert Zoellick said the pact aims to "promote the development and deployment of existing and emerging cleaner, more efficient technologies and practices". appcd was on the anvil for the last one year. But it wasn't mentioned at the recent meeting of g8 nations, in which uk prime minister Tony Blair 'attempted' to get the us to warm up to kp. T he eu hasn't taken this kindly. "If the pact is simply technology and clean coal, it is no substitute for agreements like kp ...," bbc news online quoted Barbara Helfferich, the European Commission's environment spokesperson, as saying. The uk's department for environment, food and rural affairs gave a guarded response, saying the g8 had facilitated a new dialogue involving the g8, emerging economies and international institutions to create a post-Kyoto pathway. Ulterior motives Globally, appcd has been received with considerable scepticism, though many have welcomed it for bringing the us into some form of international action to combat climate change. "The pact follows swiftly on the heels of an announcement by Paul Wolfowitz, new head of the World Bank (wb), that wb will begin to take a much larger role in addressing the climate issue. Wolfowitz...is attempting to position the bank to take a trade-based initiative that he hopes will further marginalise the un...in this area," says us -based climate change specialist Ross Gelbspan. "It is indeed disheartening to see India, China, South Korea and Japan allow themselves to be used in this charade." Jrgen Maier of German non-governmental organisation Forum on Environment and Development feels: "To look for technology cooperation for cleaner energy with these governments is absurd. It is like cooperation with the mafia to fight organised crime." "The pact, involving major exporters and consumers of coal, oil and uranium, is a political move to clean usa's image," alleges Anand Partwardhan, executive director, Technology Information, Forecasting and Assessment Council, Department of Science and Technology, Government of India. It is also being speculated that appcd seeks to address the us concern about losing technological export opportunities by being outside kp. The new group might seek agreement with kp signatories to "allow its companies, which sell clean technologies, to gain carbon permits that could be traded with companies operating under kp," suggests Pamposh Bhat of German Technical Cooperation , New Delhi, an international organisation. "The pact does not undermine kp. It will obviously benefit India through development and deployment of better technologies," reasons Pradipto Ghosh, secretary, Union ministry of environmnet and forests. But experts disagree. "In principle, the pact should help India bring down its ghg emissions. But this is yet to be seen...Cleaner technologies are really expensive...the us and Japan...should be instrumental in providing these to nations like India. But most technologies are owned by private companies, and hence the pact may not really help," explains N H Ravindranath, Centre for Ecological Sciences, Indian Institute of Sciences, Bangalore. But Partwardhan says if nothing else, appcd will help India bargain in post-2012 kp negotiations; India doesn't have an emissions cut target now but it may get one post-2012.